We followed Route 66 westward from Ash Fork, Arizona to Kingman for a better view of the Santa Fe mainline and we weren't disappointed. There was a ton of traffic over this section of track and trains were visible for very long distances. The tracks do diverge from Route 66 on a couple of stretches though, is it possible to drive near Nelson Canyon tunnel? Make sure that you refuel your vehicle in Williams, we did not see an open gas station until Kingman. 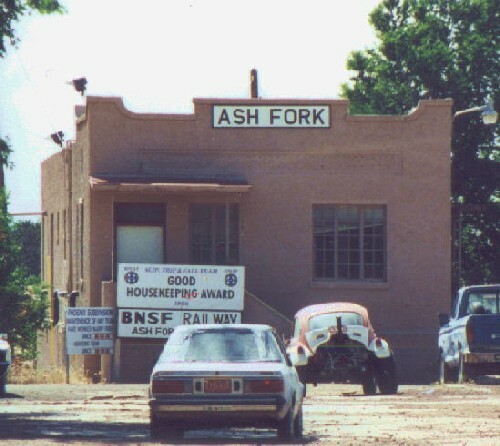 The Ash Fork yard office. Ash Fork is located on the Williams line toward Hell Canyon bridge. Is the bridge a good photo spot? I'm lining up some places when we revisit the area. SD40-2's of ATSF and BN lead a Norfolk Southern C39-8 on an eastbound general merchandise West of Seligman.